On 20 December, the Iraqi election commission released partial elections results based on more than 90% of the votes cast. Due to ongoing controversies about possible fraud (focused largely on the Baghdad area), the absence of data from the vote by Iraqis abroad, as well as a complicated procedure for assigning compensatory seats, these figures cannot yet form the basis for detailed prognoses on the composition of the next Iraqi parliament. But local-level predictions for the southern parts of the country can be made with some degree of confidence… Full story here. Towards Sectarian Separatism in Iraq? Threats to Iraq’s territorial integrity are as old as the state itself. Kurdish demands for autonomy go back almost a century. Secular Basra leaders challenged the monarchy during the 1920s through a bid for a cosmopolitan city-state republic. There were even plans for a Christian enclave in northern Iraq in the interwar period. However, missing from this list is a scheme for a sectarian Shiite breakaway state. 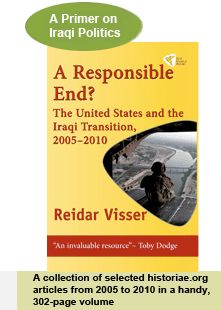 Even though outsiders frequently dreamt of this kind of scenario, the Iraqi Shiites themselves, throughout the twentieth century, appeared disinterested. With one exception, that is… Full story here. Posted in Shiite sectarian federalism | Comments Off on Towards Sectarian Separatism in Iraq? On 29 November 2005, the tiny Norwegian oil company DNO announced the start-up of drilling activities near Zakho in northern Iraq, under a deal signed with Kurdish regional authorities in the summer of 2004. Helge Eide of DNO has repeatedly told the media that he considers the arrangements to be in accordance with the Iraqi constitution. However, the legal basis of this interpretation is in itself problematic… Full story here.